The minivan is, whether anyone likes it or not, passé. There’s a stigma to minivans – they can’t be cool, or fashionable, and once you have one neither can you. While we’d argue that definitely isn’t the case, especially if you’re driving something like the Honda Odyssey, but if you’re stuck on this stigma about minivans, Honda has an alternative for you. The 2017 Honda Pilot is just as practical as a minivan while being technically classified as an SUV. It’s spacious, reliable, and features new standard technology in 2017, like Apple CarPlay and Android Auto. The Pilot excels in how much storage it offers. The Pilot is by far the roomiest SUV on the market, with an option for seven seats in the Pilot Elite, the rest of the models having five seats. If you need to transport many people, or a lot of cargo, this is the SUV for you. It has a movable cargo floor that can be set up for maximum space or can be changed to create an underfloor storage compartment – making it easy for you if you need to transport lots of cargo. 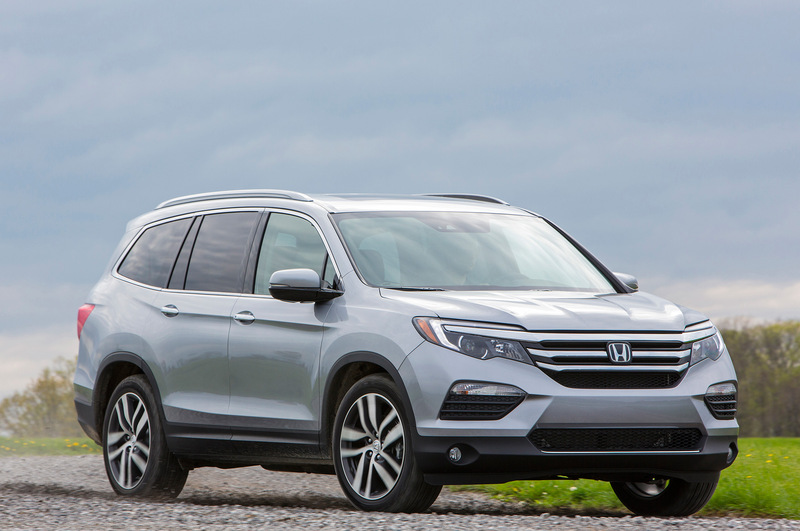 Though from the outside it does look more like a minivan than the other SUVs currently on the market, the Honda Pilot still manages to avoid the stigma while giving you all the benefits you need from a van. The dashboard layout of the Pilot is simple and aesthetically pleasing. The dashboard features easy to use control systems for the climate controls and a clearly marked gauge cluster. An 8.0-inch touch screen sits in the center. Within the Pilot Elite, the model with three rows, the car features 16 cup holders, giving ample room to each of the seven passengers that the car can hold. The 2017 model traded in the box-style of a typical SUV profile, opting for a more rounded, sleeker look. This made the Pilot look more along the style of a minivan than an SUV – however it does lack the sliding doors which are a staple in vans. The Pilot Elite and Touring models feature 20-inch wheels, and both models (as well as the EX-L model) also feature a standard sunroof. If you’re thinking of getting an SUV because you don’t like the thought of a van, there’s no reason to look further than the 2017 Honda Pilot. The Pilot has space and the functionality you’d be looking for in a minivan, but will still feel cool and sleek to drive. Connect with us here at Henley Honda for more information on how to get into a Honda Pilot today.